Update October 4, 2014 - To view a full schedule of events, click here. 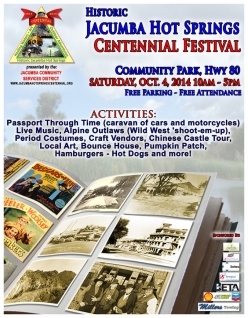 August 28, 2014 (Jacumba Hot Springs)-- Jacumba Hot Springs is gearing up for its Fall Centennial Festival set for Saturday, October 4, 2014 in Jacumba’s Community Park on Old Highway 80 in the heart of this historic town. The hours are 10 a.m. to 5 p.m. Admission and parking are free. The festival will feature the Alpine Outlaws, recognized for their authentic western shoot-out skits, craft vendors, children’s bounce houses, live music, raffles, a pumpkin patch, a swap meet, tour of the Chinese Castle (there is a small fee for the tour) and more. The Festival is also the ending point for the Passport Through Time car caravan sponsored by the Old Highway 80 Corporation. The caravan travels from points west along scenic Historic Old Highways 94 and 80 stopping at different businesses along the way. This mixture of classic cars and motorcycles are always a crowd pleaser. They are expected to arrive in Jacumba starting around noon. 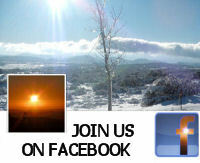 The Historic Highway 80 Corporation is a non-profit, charitable organization. While most activities are free, the Chinese Castle Tour requires a wristband purchased for $5.00 at the Centennial HQ Booth. The Chinese Castle is a privately owned spectacular historical home, rife with legend and interesting oddities, located on a hill in Jacumba. The Jacumba Community Services District is presenting the event, and is featuring grilled hot dogs & burgers, assorted soft drinks & water for purchase. Friends of the Library will offer a variety of baked goods. The Jacumba Community Services District, formed in 1985, provides potable water and park and recreation services within the unincorporated east-county community of Jacumba Hot Springs. The Jacumba Hot Springs Spa & Resort offers day use passes to take the waters and rooms for those seeking overnight stay. Dry RV space is available as well. About Jacumba’s historic past: In the beginning, Jacumba (as it was then called) was a convenient stage coach spot and ranch area.Hollywood discovered scenic Jacumba Hot Springs (JHS) in the 20's and many films and documentaries were filmed in and around the community. In its Hollywood 'heyday', famous actors such as Clark Gable were said to visit Jacumba for its waters. Festival sponsors include: Beta Engineering, Jacumba Spa, Miller’s Towing, SDG&E, Sempra, Soitec, Jacumba Subway Chevron & Shell and the Jacumba-Boulevard Revitalization Alliance.